Flaky bites of tuna, tender pasta and vegetables in a rich creamy Alfredo sauce. Yum! 1. Heat the oven to 375 degrees F. Spray a 2-quart baking dish with nonstick cooking spray. 2. Cook the pasta according to the package directions using minimum cooking time: drain. In a large bowl, combine the Alfredo sauce, chicken broth, Italian seasoning, lemon peel, tuna, peas, mushrooms and pasta; spoon into the baking dish. 3. In a small bowl, blend the bread crumbs and melted butter; sprinkle over the pasta mixture. 4. Bake for 25 to 30 minutes or until hot and bubbly and the topping is golden brown. Makes 6 servings. 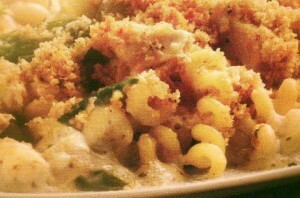 I can’t remember the last time I had a tuna casserole and this sure looks good – I’m a big fan of casseroles. Emily – regarding your comment on my shrub post. I learned the basics during my Master Gardener training, then for my own use and to help others over the years, I’ve researched specific plants.